The last preserves of the season… well, for this season anyway. Tomato Basil Jam. I read about this jam last year and have been intrigued by it ever since. I wondered if it would taste good, if it would be tough to make, and if I could figure out what to put it on. Well, it is delicious. It was not too tough. And like many of the more “decorative preserves” they go great with cheese and crackers, a component on an interesting sandwich, or simply on top of an english muffin… maybe not an everyday work horse, but since I enjoy eating these things, it works. More importantly, in November, or January, or June when tomatoes are not in season this little number will provide a hit of late August sunshine that might be very welcome in any form. 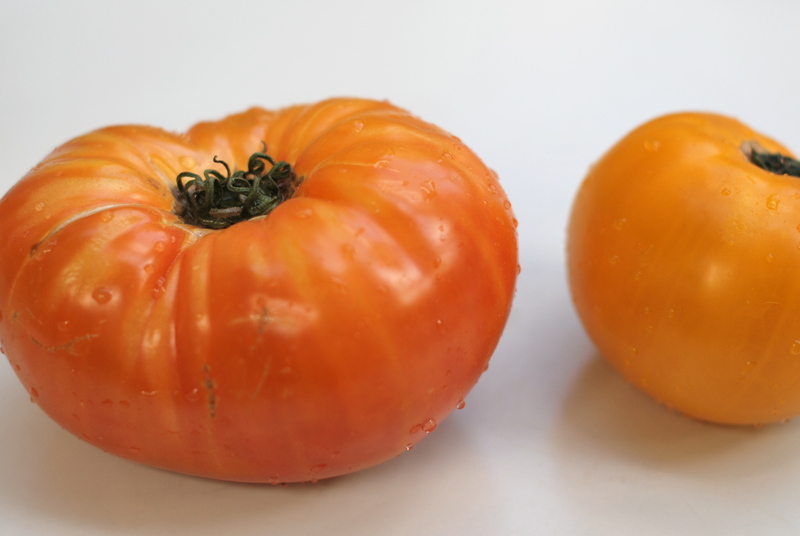 Things have been very busy, so I almost didn’t write this one up, but I do like the idea of having a record here of what I made this summer and photos of heirloom tomatoes are simply good for the soul. So here it goes. I found these lovely heirloom tomatoes from our local farmer’s market and was given a deal because these were not even the most attractive of the bunch. Keep that in mind when shopping for produce for jams – you want the fruit to be ripe, but it does not need to be beautiful! The recipe I used is taken from Canning For A New Generation, by Liana Krissoff. 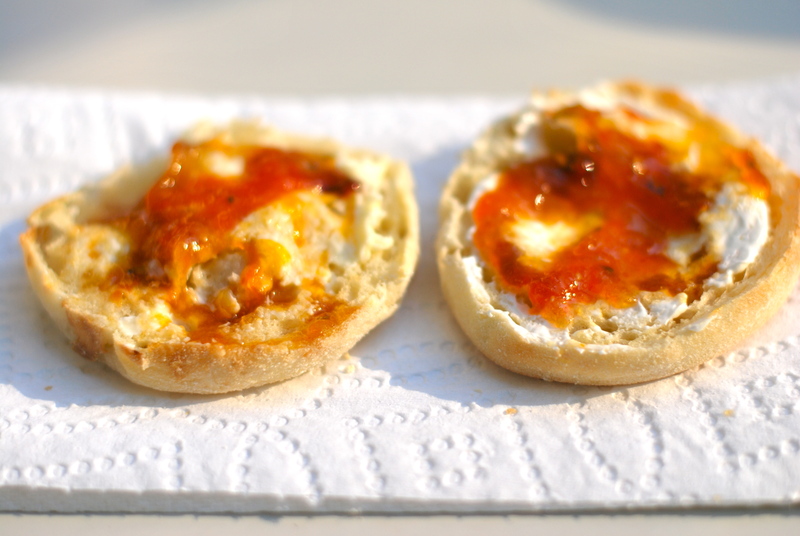 The thing that sold me on this recipe is the opening line, “There’s almost nothing more appealing than a toasted and buttered english muffin spread with the herbal sweet-tart goodness of tomato and basil jam.” I mean, who wouldn’t want to make that? 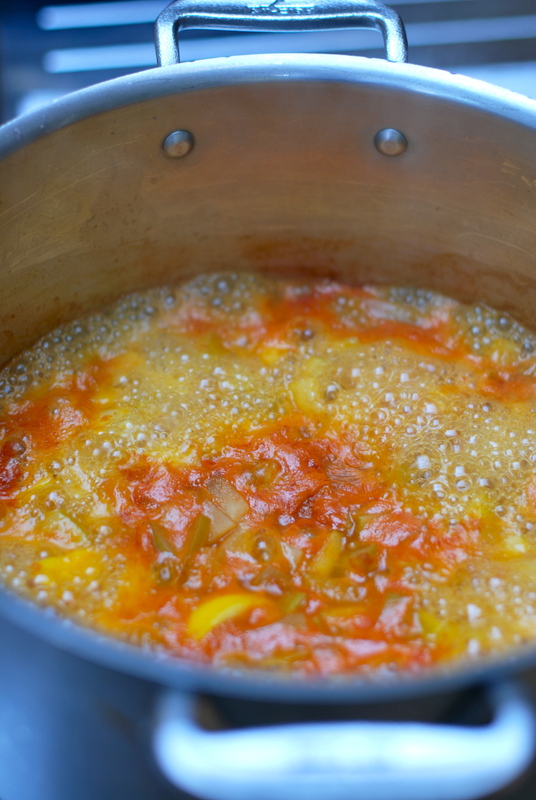 Put the tomatoes in a wide, 6- to 8-quart preserving pan. 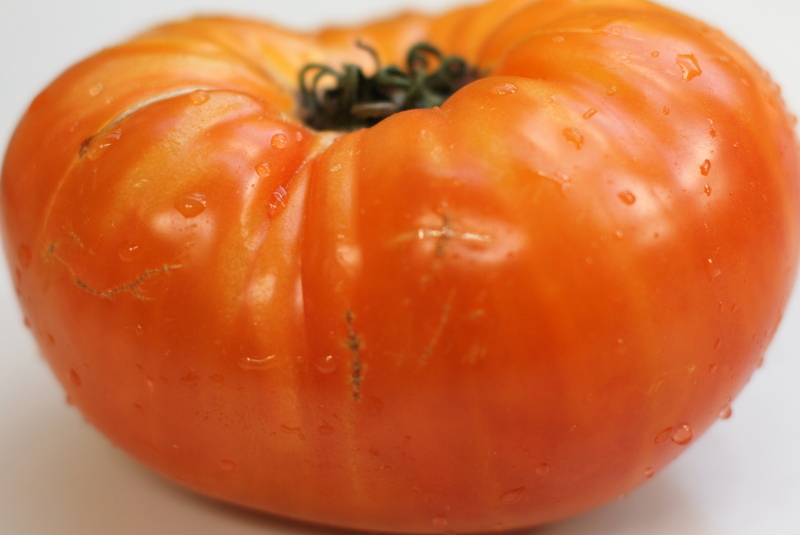 Bring to a boil over high heat and cook until the juices cover the tomatoes, about 5 minutes. Pour into a colander set over a large bowl. 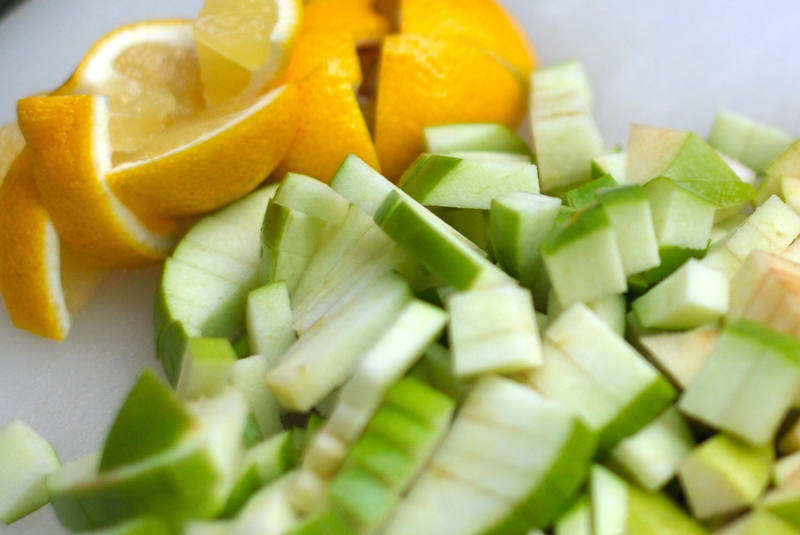 Return the juice to the pan and add the apples and lemon. Bring to a boil over high heat. Boil, stirring occasionally, until the apples are completely broken down and the peels have separated from the pulp, about 15 minutes. 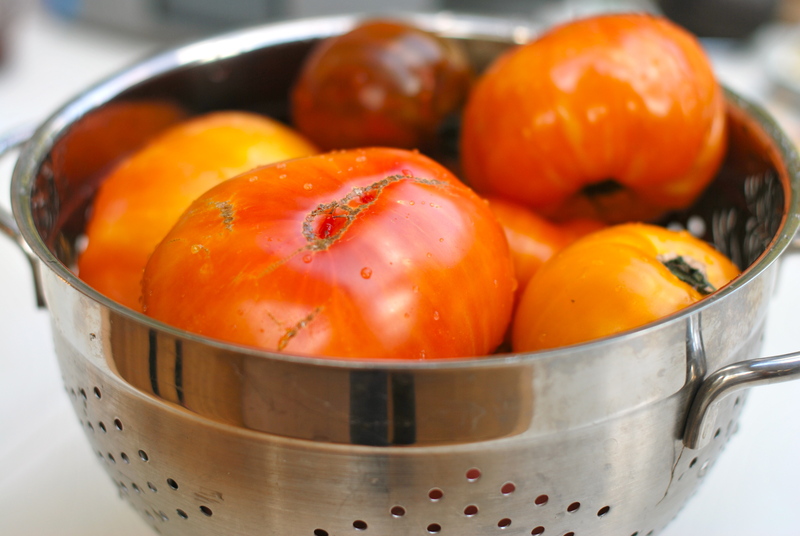 Dump the tomato solids into the bowl and place a sieve over the bowl (I didn’t have one of these, so I used my colander.) Pour the apple and lemon mixture into the sieve and press as much of the juice and apple pulp through the sieve as you can. Discard the solids in the sieve. 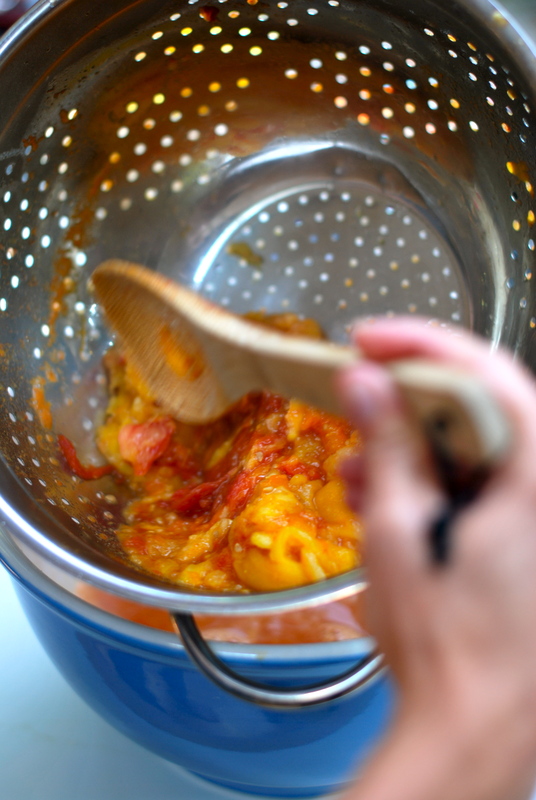 Rinse the preserving pan and pour the tomato mixture; add the sugar and vinegar. 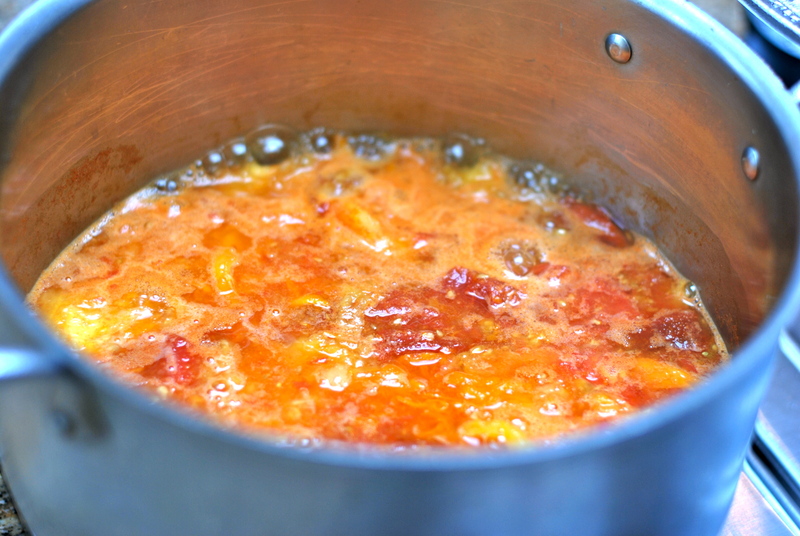 Bring to a boil over high heat and boil, stirring frequently, until a small dab of the jam spooned onto the cold plate and set in the freezer for a minute wrinkles when you nudge it, about 15 minutes. Remove from heat and stir in the basil. Fill jars and process in water canning bath for 5 minutes. Makes about 4 half pint jars. Thanks for stopping by, Seasonsgirl. I agree with you that there is definite satisfaction in knowing that there is a basement full of goodies, just waiting for winter. This helped calm me so much when I was pregnant last year – I nested through canning! Take care. And weren’t you smart to have your basil growing by your back door! Looks delicious!